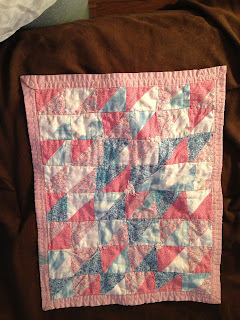 This is a tiny quilt, no bigger than a standard bed pillow or a large placemat, that I made in 1999. As quilt specimens go, its awful. The piecing is not squared. The quilt top is not squared. The machine quilting is 5 parallel lines. There were five clusters of silk ribbon embroidered roses but they have mostly come apart and unraveled. Despite its flaws, over the years it has graced doll beds, wrapped up puppies, been worn as a cape, and been placed under tushies for miniature picnics. So while it is not the epitome of quilting craftsmanship perhaps someday it will be regarded as an heirloom.